Latest news, product information and updates from PetControlDepot.com. Special pet products including pet fences, bark control collars, pet beds, dog agility equipment, dog training collars. Petsafe,Kittywalk,SportDog,Snoozer,Radio Fence,Innotek, K&H and Drinkwell. 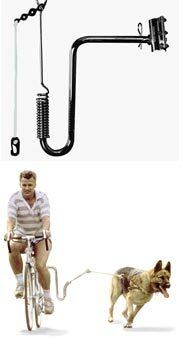 The Springer Bicyle Jogger makes it possible for you to enjoy biking and exercising with your dog at the same time. Easily attaches to your bicycle and can be mounted on either side. Low mounted coil spring absorbs and reduces the dog's tugs & pulls by up to 90%, making it easy to keep balance. He is held gently but firmly beside the bike, keeping him from interfering with the pedals or wheels. The Aquarius Hex Shaped Aquarium is a seamless 1.7 gallon aquarium kit and the gold standard for desk top kits. It comes complete with an air powered undergravel filter system and light hood. Includes: * Light Hood, * 2 Gallon Capacity, * Filter System and * Air Pump. 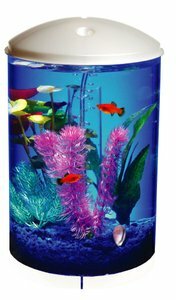 This unique cylinder shaped aquarium offers a seamless, 360 degree panoramic view of your fish. It features dazzling multi-colored LED lights in seven color choices that you can set to or change as you wish. The hood was shaped and specially designed to glow with your choice of color, creating a fabulous light effect at night or in any darkened area. 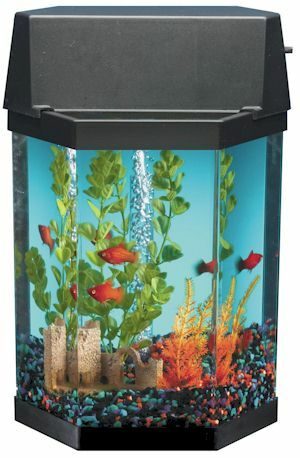 Constructed out of a durable polymer resin, the AquaView 360 makes a spectacular addition to your home or office decor. Give Your Dog a Key to the House! Grant your dog exclusive access to your home, locking out unwanted visitors. The award-winning Smart Door recognizes the SmartKey™ tag on your dog’s collar and unlocks the dog door. After your dog has passed through, it re-locks automatically. The PetSafe Electronic Smart Door recognizes the collar "SmartKey" on your dog and unlocks to allow your dog access. The sensing range is adjustable up to 3 feet. After your dog passes through, the door will relock again automatically. Animals without the SmartKey are not able to enter. You may have a total of 5 SmartKeys in use at one time. 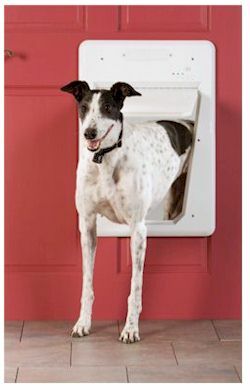 PetSafe Kennels are an easy do-it-yourself option to pet containment. All kennels are constructed with rust-resistant, galvanized steel. Now you can create a full-size chain-link kennel from the contents of a single box. PetSafe do-it-yourself box kennels can be transported with ease - and can be set up quickly with the help of a few simple hand tools. In next to no time, your furry pal will be ready to assume his rightful position in the sun. The perfect area just for your pet! It's easy to assemble with common hand tools, and there are no holes to dig or concrete to mix. For almost any space inside or outside. 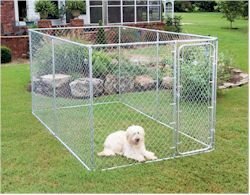 Complete kennel in a box features rust-resistant galvanized steel construction, pre-assembled gate, and all components.